Amazon.com description: Product Description: THE BEST SELLING BULL TERRIER BOOK IN THE WORLD! Join Milo, the long forgotten Bull Terrier, as he travels the world in search of nothing more than a friend he can call his own. 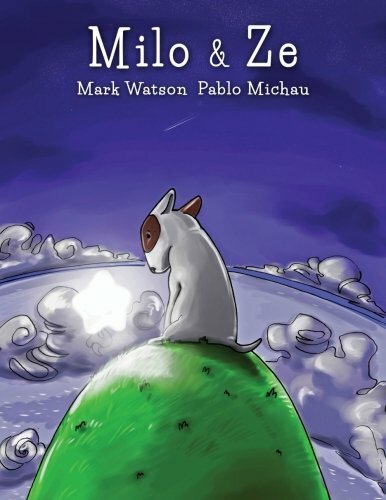 Milo & Ze is the eagerly-awaited second illustrated children's picture dog book for kids by Mark Watson and Pablo Michau, authors of the bestselling, "The Shark in the Park". Milo & Ze makes the perfect Bull Terrier gift for kids, dog lovers and bully fans alike. "Milo is a cute bull terrier puppy who has been forgotten, locked in a kennel, until one night a blinding light comes out of the night sky and smashes his kennel creating a crater that the bull terrier braves his way to peer into and hears a mole who asks his name and the little bull terrier discovers a fallen star: `'Never again need you wish for a friend, he waits for you at your journey's end.' And off our Bull Terrier puppy goes on a journey, sees a truck, meets Big the Pig who invites him to his yacht which turns out to be a leaky barge but Milo jumps ship and ultimately comes ashore to see Big the Pig safe and free. Milo meets a pelican who gives him a ride. The next ride is on a camel but a sandstorm hits, covers the little bull terrier, but he is discovered by an elephant who helps him on his journey. But more adventures arise - a tiger, a mountain goat, a cavern and finally, the little bull terrier puppy arrives at the door where lives an Indian lad by the name of Ze: Milo finally has a friend of his own. Enchanting rhyming verse, exquisite illustrations and a heartwarming adventure that simply is restorative and makes the reader feel good. Searching for friends - a great goal and a wonderful destination. Highly recommended for children and art loving adults." Terrifying, funny, thrilling! This new, beautifully illustrated children's rhyming action and adventure dog book for kids is available in paperback and for kindle. The Kindle version includes links to exclusive interactive content. This book is adorable for young kids but is also an enjoyable Bull Terrier book for the whole family. Also fun or to be read aloud, this children's picture book has become one of the most popular dog books for children ever. About: THE BEST SELLING BULL TERRIER BOOK IN THE WORLD!